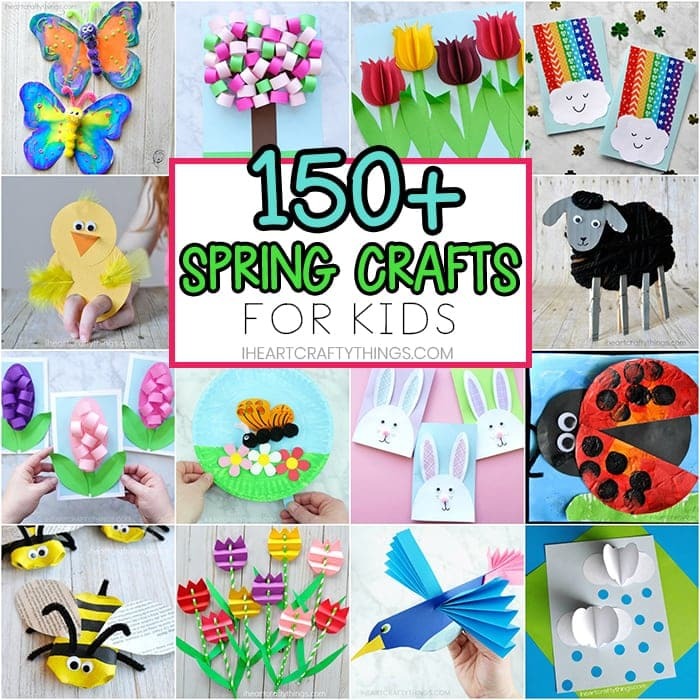 Spring is the perfect season for learning all about birds and making bird crafts. 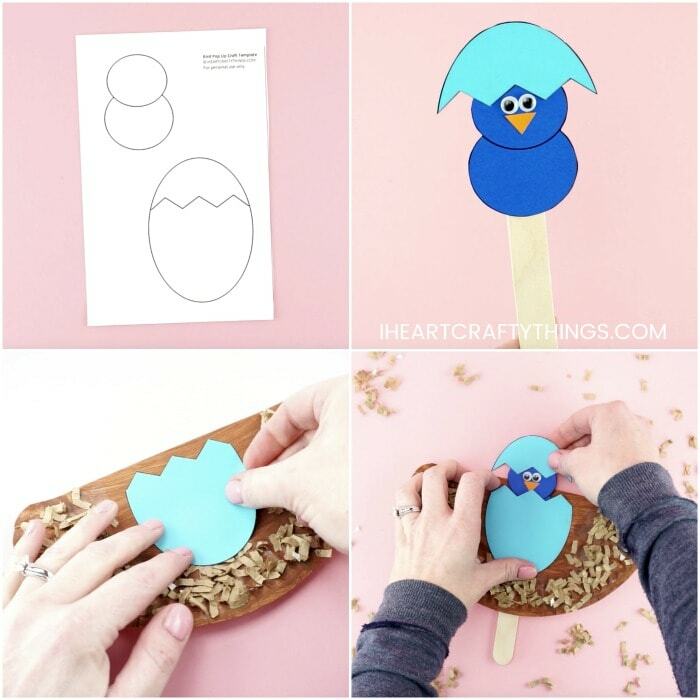 This pop up bird craft is super easy for kids of all ages to create with our handy free template. 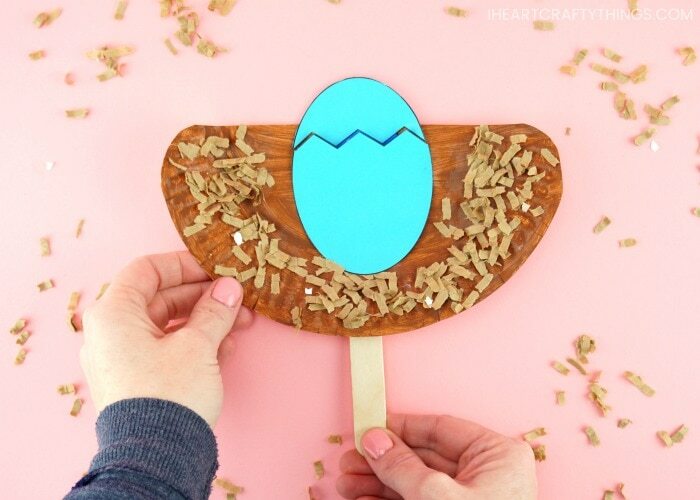 After making the craft, toddlers and preschoolers get the added bonus of playing with the paper plate craft, watching as their bird pops up and hatches out of the egg in the nest. 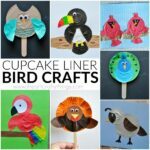 This simple bird craft is easy for preschoolers and kids to create with materials you probably already have on hand at home too like colored cardstock paper, paper plates and a brown paper bag. 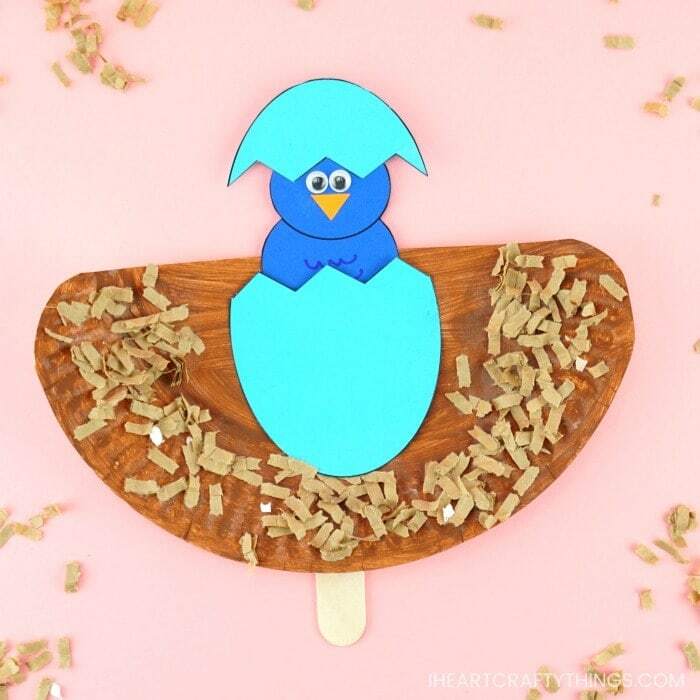 You’ll definitely want to add this easy pop up bird craft on your spring crafts list this year along with a few more of our easy pop up card ideas. 1. 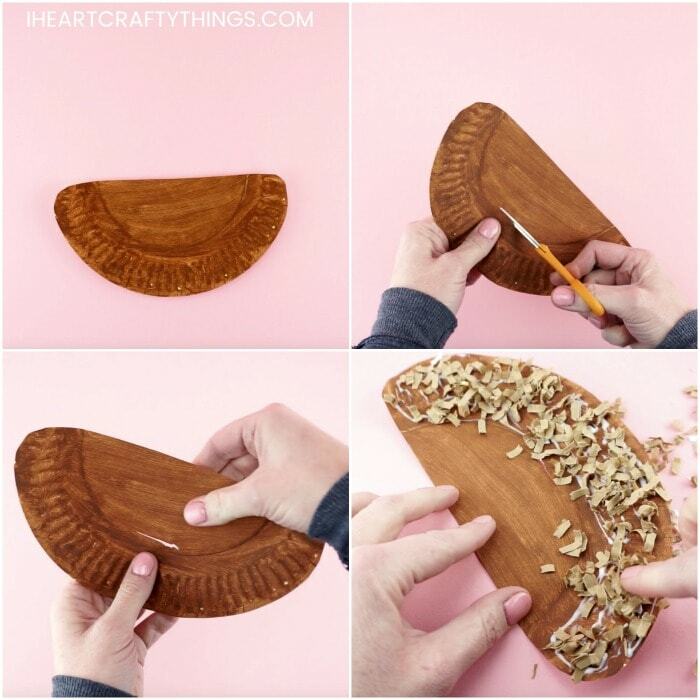 Begin by cutting your paper plate in half. Use your scissors to cut and round the edges of the paper plate half to give it the shape of a bird nest. 2. 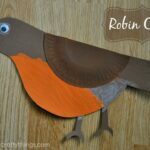 Paint your paper plate bird nest with brown paint. 3. When your brown paint is dry, use scissors to poke a hole above the bottom textured rim of the paper plate and cut a slit in the middle of the paper plate large enough for your large craft stick to fit in. 4. Apply glue around the bottom rim of the paper plate. Add shredded brown paper on the glue. Set aside the paper plate bird nest to let the glue dry completely. 5. Print out the pop up bird template. You have the option to print the template on white cardstock and let children color it with markers or crayons. Or we also have an option with the eggs and the bird piece on separate pages so you can print them on colored cardstock. 6. Cut out the bird and egg from the template. Then cut across the dotted line of the crack in the egg to create two pieces. 7. Add glue at the top of the bird head and attach the top of the egg to it. 8. Cut out a small triangle beak from orange cardstock or construction paper and glue it on your bird face, along with two small googly eyes. 9. Add glue at the top of your large craft stick and attach it to the back of your bird. 10. Use your glue stick to place a line of glue right below the open slit of your paper plate and on the sides of the open slit up to the top edge of the paper plate. Place the bottom half of your bird egg on the glue. 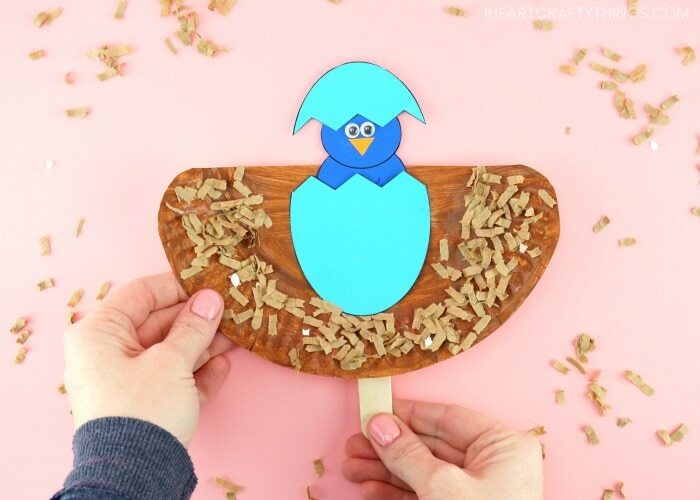 It’s time to play with your pop up bird craft! Place the large craft stick down into the bottom half of the bird egg and through the open slit you cut in the paper plate. The craft stick will come out on the back of the paper plate. Use one hand to hold your paper plate in place and use your other hand to hold the large craft stick. Move the craft stick up and down and watch as the bird is pushed up and pops out of it’s egg. Continue moving the craft stick up and down to make your bird hide back in the egg or pop back out. 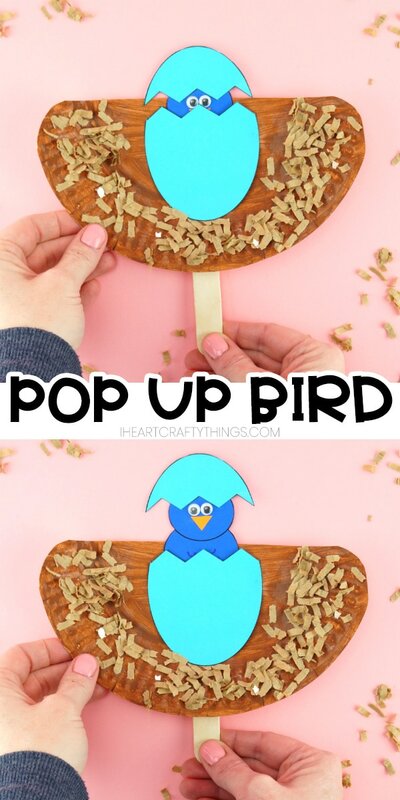 Watch the video below to be guided through each step of our bird pop up craft. 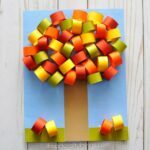 Find more pop up cards and easy kid craft ideas by browsing the categories at the top menu bar of our website. This pop up love birds card is one of our favorites. Open the card to discover two birds singing to each other on a tree branch on the center fold. Close the card easily and give it to someone special.